Southeast New Jersey Farmer's Markets: Find a local farmer's market near you in Southeast New Jersey for fruit, vegetables, pumpkins, organic foods,local produce and more! Looking for a local, true farmer's market in Southeast New Jersey? Scroll down this page and you will see the farm markets, farm stands, roadside stands, produce markets, even garden fruit and vegetable stands and seasonal community farmer's markets in Southeast New Jersey, sorted by county. Markets offering organic or sustainably grown produce are identified by the words "organic" and/or "sustainable" in Green, next to their name. If they have a website, the name will be in blue and underlined; click on it and it will open their website. 1400 Route 50, Petersburg, NJ 08270. Phone: 609-579-8927. Alternate phone: 609-579-3823. Open: dail, 9 am to 7 pm. We offer a variety of seasonally fresh produce, fruit, herbs, flowering plants, and tomatoes all available at our Farmers Market located right on our farm. Have a look around to see how we grow our tomatoes from seedlings to sweet & tasty tomatoes and where you can visit our farmer's market! 939 Ramah Road, Millville, NJ 08332. Phone: 609-579-8927. Alternate phone: 609-579-3823. Open: dail, 9 am to 7 pm. We offer a variety of seasonally fresh produce, fruit, herbs, flowering plants, and tomatoes all available at our Farmers Market located right on our farm. Have a look around to see how we grow our tomatoes from seedlings to sweet & tasty tomatoes and where you can visit our farmer's market! 862 Route 539, New Egypt, NJ. Phone: (609) 752-5591. Directions: 41/2 miles S of Route 537 on Route 539, farm on left or 7 miles N of Route 70, farm on right. Email: krowickifarms@yahoo.com. Open: Daily, April - Oct, 9 am to 5 pm; peaches usually start in July. 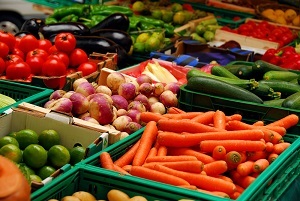 Asparagus, sweet corn, cantaloupes, watermelon, honey dew, apples, cauliflower, pumpkins, winter squash, blueberries, potatoes, strawberries, beans (Lima, string), peas, broccoli, cabbage, lettuce, turnips, beets, squash, tomatoes, radishes, cucumbers, onions, peppers (bell, fryer, hot), eggplant, plums, nectarines, cherries, apricots, bedding plants, vegetable plants, hanging baskets, potted plants, herbs. We also have Straw for wholesale or retail, corn stalks, mums.